Leland Holeman and Amelia Cook understand the power of brand and its importance to their business success. They inherited the business name and branding when purchasing the internet side of the original Goodwinds kite supply and, as their business has grown, that identity became less effective. The brother and sister pair have become the king and queen of carbon and fiberglass rods and tubes and, while they still serve kiters, larpers, and other craftsmen and hobbyists, the majority of their clients are now in the aerospace industry. We gave them a new logo and then began the process of updating their print collateral and cadre of websites. 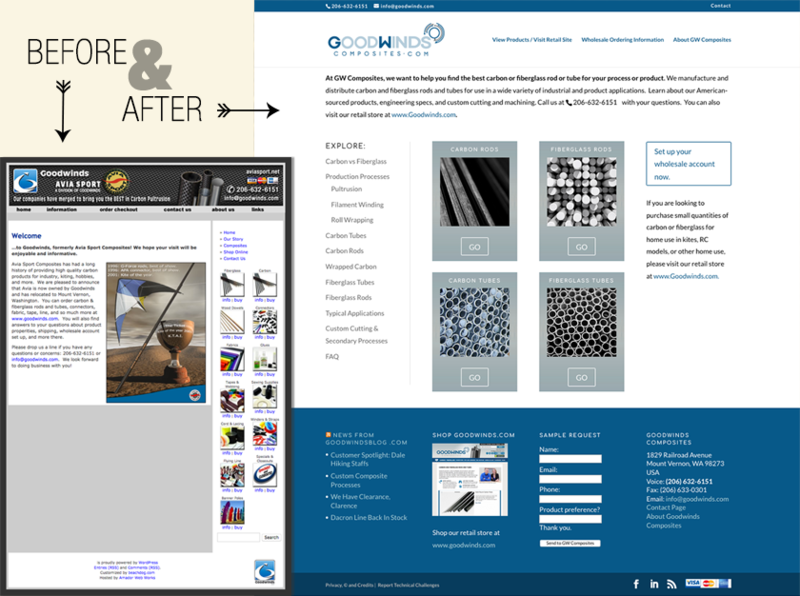 GWComposites.com is a site designed for the wholesale arm of the company. We like the facelift, which updated code, made the site fully responsive, and reorganized content a bit. The biggest changes were visual with the site having a much more professional look and feel that is clean and targeted to the scientificallly minded average user. Most importantly, the new visual identity is serving the business well, which is the real test of a project like this. Next What happens when your software updates itself and breaks your site? Previous Fresh Fish & Cash in Your Pocket? Nice.